This time of year is filled with excitement for many would-be students. Exam results are in – and as the summer draws to a close the preparations to fly the nest begin. But while it’s an exciting and momentous occasion – it can be a difficult time for the parents, friends and family members who have to say goodbye. As a parent, you’re probably bursting with pride, but feeling emotional at the same time – so it’s the perfect opportunity to mark this special occasion with a gift that shows your loved one how much they mean to you, before they head out into the wider world. It could be a son, a daughter or even a friend. Whoever you’re saying goodbye to, mark the occasion with something that they will treasure. We’ve put together this gift guide with beautiful jewellery that’s perfect to give as a going away present, and ideal for anyone heading off to University in the new school year. 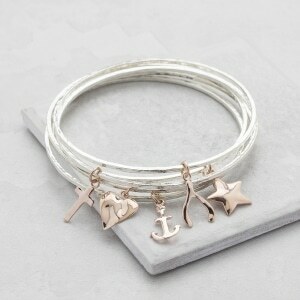 This beautiful bangle is a wonderful present for someone flying the nest and heading off to uni. The silver bracelet has smooth edges and glides on and off the wrist, and due its unique design, it is flexible and adapts to different wrist sizes! Engraved with the words ‘Live Love Sparkle’ in a classic font, it provides a subtle reminder of a great mantra to live by. This beautiful rose gold and silver bangle is a great gift option – with the option of five different charms; as star, an anchor, a heart, a wishbone or a cross. Any one of these charms can have a deeper meaning – but for someone heading off to university – we’d definitely choose the wishbone charm for good luck! Nothing says ‘you’re a star’ like this gorgeous and versatile silver star necklace. Available in both a polished and a satin finish, this is a beautifully simple piece of contemporary jewellery, perfect for everyday wear. This necklace is great for those who want to give a heartfelt gift that marks a momentous occasion – but can be worn again and again. 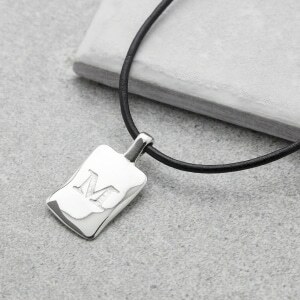 This rectangular charm is crafted from solid silver, and sits on a soft black leather cord – giving a stylish but masculine feel. The charm is available in a polished or satin finish, and can be engraved with an initial to add a subtle element of sentiment to a stylish and robust piece of jewellery. 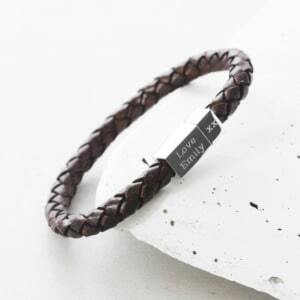 This men’s leather bracelet comes in a gorgeous antique brown colour, and features a polished steel magnetic clasp which can be personalised with your engraved words. Choose a heartfelt message, a good luck wish, or even a secret phrase that has meaning to the lucky recipient. A perfect gift to mark a special occasion. If you want to give a ‘going away to uni’ gift that is sentimental, but not overtly so – then this personalised men’s bracelet is perfect, as it has the option to engrave a secret message that only the recipient will know about. Choose a phrase to help them feel comforted when homesick – or simply say ‘I’m thinking about you’ when they embark on this new and exciting journey.